Captain James Ham | Launceston Then! James Ham was born on September 26th 1838 to Thomas and Ann (nee Phillipps) Ham at Newport, Launceston. His father worked in the wool trade. James attended Horwell Boys school in Launceston. At the age of 17 James emigrated to America, taking up residence at Honesdale, Pennsylvania. Shortly after his arrival he was appointed Deputy Postmaster, by Mr John Y Sherwood, a position which he maintained during Mr Sherwood’s incumbency of the office, and which he afterwards filled under Postmasters Wheeler and Briggs. East Cornwall Times, 1st April 1865: AMERICAN CIVIL WAR. DEATH OF CAPTAIN JAMES HAM, SON OF MR THOMAS HAM OF NEWPORT, LAUNCESTON.Honesdale, April 6th, 1865. Captain Ham was killed in battle on April 2nd, whilst serving under General Sheridon, in pursuit of General Lee. He lived five hours after being wounded. Captain Ham was born at Newport, Launceston, Cornwall, England, September 26th 1838 and was consequently 26 years and 6 months old at the time of his death. In 1855 he came to America, and became a resident at Honesdale, where he had relatives living. Shortly after his arrival he was appointed Deputy Postmaster, by Mr John Y Sherwood, a position which he maintained during Mr Sherwood’s incumbency of the office, and which he afterwards filled under Postmasters Wheeler and Briggs. While in the Post Office Mr Ham won a high place in the esteem of our residents by his prompt and courteous manner of discharging the duties of the position. Through the influence of the Hon. 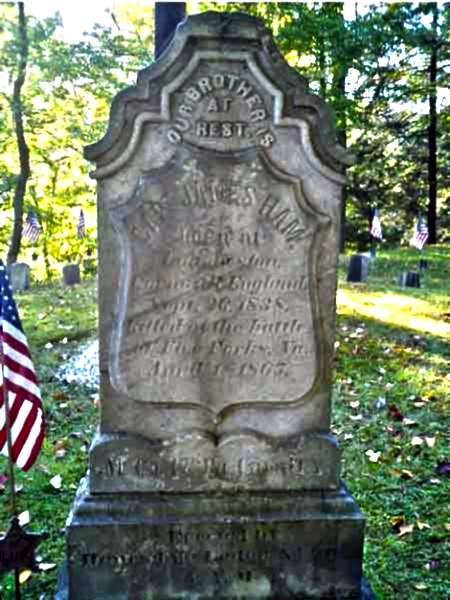 WHD Dimmick, he was appointed mail agent on the Belvedere Delaware RR., a position which he could not accept owing to his not having become a citizen of the US.While acting as assistant for D Briggs, an effort was made to raise a cavalry company in this county, and Mr Ham was entered into the work with his customary determination and zeal, and it was through his instrumentality that on the 1st of September, 1862, the Wayne Co Cavalry Co was organised in this borough.On the twenty-second of the same month, the company was mustered into the service, at Harrisburg,, as Co M Penn Cavalry, Captain CC Brown commanding, and James Ham filling the position of First Lieutenant.On the 16th February 1863, Captain Brown resigned on account of physical disability, and Lt Ham was elected to fill the vacancy. He has since that time been almost constantly with his command, among whom, he has enjoyed a high and well deserved popularity. The Company (part of Sherman’s Division) has continually been in active service, sometimes having been kept on the move for fifty or sixty days in succession, and always on the most important and perilous duty. It has probably participated in as many engagements as any similar organisation of the Army.It distinguished itself at Chancellorsville, Beverly Ford, Upperville, Gettysburg, Williamsport, Boonsboro, Falling Waters, Brandy Station (August 1st & October 12th, 1863), Culpeper CH, Bacon Ford, Barnett’s Ford (September 23rd, 1863 & February 6th & 7th, 1864), Martin’s Ford, Cook Hill, Spotsylvania, Cold Harbour, White House Landing, Petersburg (August 1864), and nobly did its duty in the late struggle which cost its brave commander his life. Captain Ham’s parents are still living in England, and he leaves a wife and one little boy to mourn his loss here. The blow is a fearful one to Mrs Ham, she having been bereft of a grand-father, father, husband, and son during the past year, the three last named having all died within the past few weeks.Ham’s remains were embalmed and taken to Bethany, where his son, an interesting lad of five or six years of age, was buried only a short time since. (Extract from Wayne County Herald, 1865).